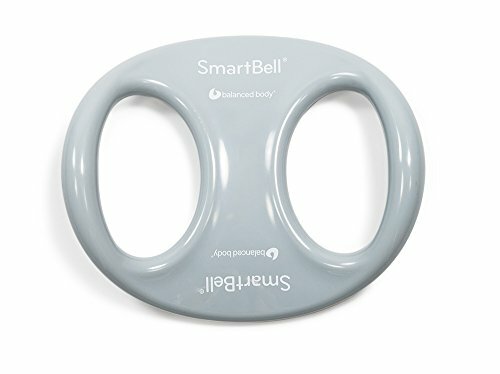 Uniquely shaped to carve through space in flowing, rotational movements, we love the sculptural and ergonomic design of SmartBells. The two-handed grip allows a high level of control while conforming to your body, and when physical challenges call for holding it with both hands. The extended flowing movements stretch and tone your whole body or targeted muscle groups. Designed to be both aesthetically pleasing to the eye, and comfortable to the touch, you also get a clear stand, so you can display the SmartBell and keep it conveniently stored. This product is gray and weighs 1.5 lbs. Uniquely shaped to carve through space in flowing, rotational movements. Two-handed grip allows a high level of control while conforming to your body, and when physical challenges call for holding it with both hands. Designed to be both aesthetically pleasing to the eye, and comfortable to the touch, you also get a clear stand, so you can display the SmartBell and keep it conveniently stored. This product is gray and weighs 1.5 lbs. If you have any questions about this product by Balanced Body, contact us by completing and submitting the form below. If you are looking for a specif part number, please include it with your message.